JERUSALEM (AP) — U.S. Secretary of State John Kerry said Sunday that the United States will support Iraq's fight against al-Qaida-linked militants who have overrun two cities, but won't send in American troops. Kerry said the militants are trying to destabilize the region and undermine a democratic process in Iraq, and that the U.S. is in contact with tribal leaders in Anbar province who are standing up to the terrorists. But, he said, "this is a fight that belongs to the Iraqis. That is exactly what the president and the world decided some time ago when we left Iraq, so we are not obviously contemplating returning. We are not contemplating putting boots on the ground. This is their fight. ... We will help them in their fight, but this fight, in the end, they will have to win and I am confident they can." Al-Qaida linked gunmen have largely taken over the cities of Fallujah and Ramadi in an uprising that has been a blow to the Shiite-led government of Iraqi Prime Minister Nouri al-Maliki. Bombings in the Iraqi capital, Baghdad, killed at least 20 people Sunday. Anbar, a vast desert area on the borders with Syria and Jordan, was the heartland of the Sunni insurgency that rose up against American troops and the Iraqi government after the 2003 U.S.-led invasion that toppled Saddam Hussein. In 2004, insurgents in Fallujah killed four American security contractors, hanging their burned bodies from a bridge. Ramadi and other cities have remained battlegrounds as sectarian bloodshed has mounted, with Shiite militias killing Sunnis. "We are very, very concerned about the efforts of al-Qaida and the Islamic State of Iraq in the Levant, which is affiliated with al-Qaida, who are trying to assert their authority not just in Iraq, but in Syria," Kerry said. "These are the most dangerous players in that region. Their barbarism against the civilians in Ramadi and Fallujah and against Iraqi security forces is on display for everyone in the world to see." Kerry made the comments as he left Jerusalem for talks with leaders in Jordan and Saudi Arabia about his Mideast peace-making efforts after three days of lengthy meetings with Palestinian President Mahmoud Abbas and Israeli Prime Minister Benjamin Netanyahu. Kerry said some progress was made in what he described as "very serious, very intensive conversations," but key hurdles are yet to be overcome. 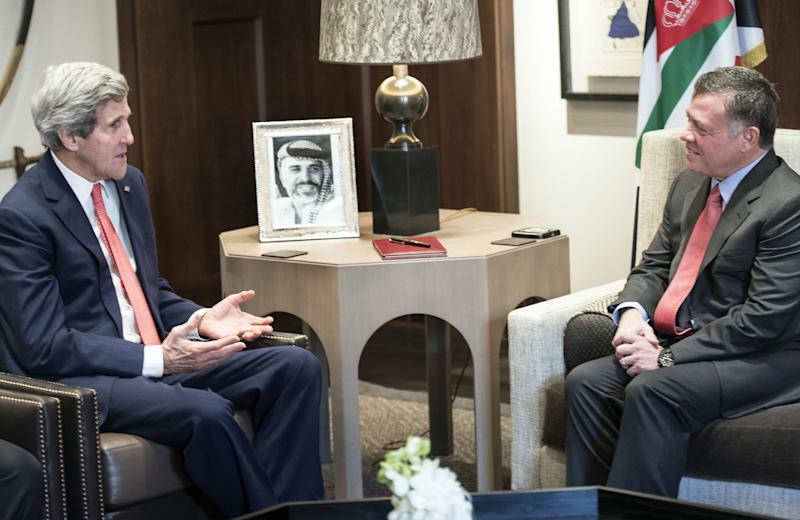 His talks with Jordan's King Abdullah II and Foreign Minister Nasser Judeh covered the peace process, Syria and Iraq. 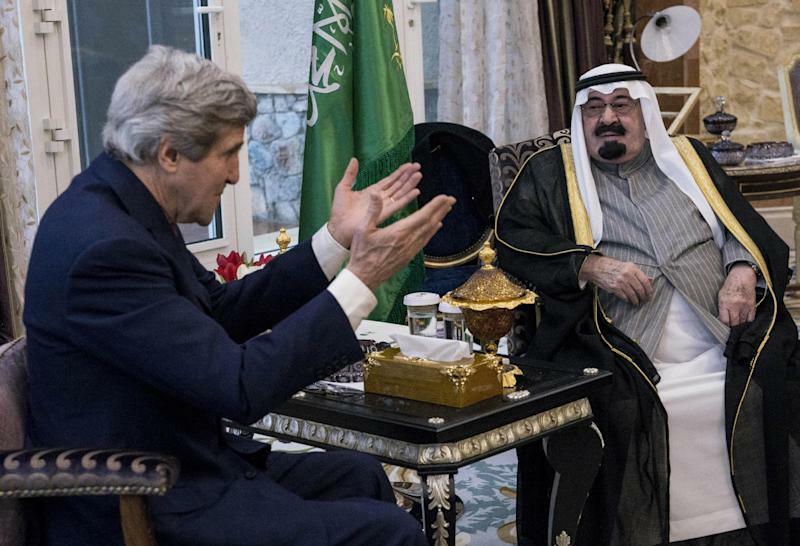 After his short stay in Amman, Kerry flew to Riyadh, Saudi Arabia, and then took a 30-minute helicopter ride to King Abdullah's desert palace. The Saudi leader developed an initiative in 2002 in which the Arab world offered comprehensive peace with Israel in exchange for a full pullout from all territories it captured in the 1967 Mideast war. The initiative, revolutionary when it was introduced, has been endorsed by the Arab League and, technically, remains in effect. "Saudi Arabia's initiative holds out the prospect that if the parties could arrive at a peaceful resolution, you could instantaneously have peace between the 22 Arab nations and 35 Muslim nations, all of whom have said they will recognize Israel if peace is achieved," Kerry said. "Imagine how that changes the dynamics of travel, of business, of education, of opportunity in this region, of stability. Imagine what peace could mean for trade and tourism, what it could mean for developing technology and talent, for job opportunities for the younger generation, for generations in all of these countries," Kerry said. Kerry said after his meeting with the Saudi leader that the king said he supported Kerry's peace efforts and the Abdullah's initiative "has been part of the framework that we've been piecing together — both in inspiration and substance." Kerry, who arrived in the region Thursday, is trying to nudge Abbas and Netanyahu closer to a peace pact that would establish a Palestinian state alongside Israel. The talks have entered an intense phase aimed at getting the two sides to agree on a framework and provide guidance toward a final settlement. 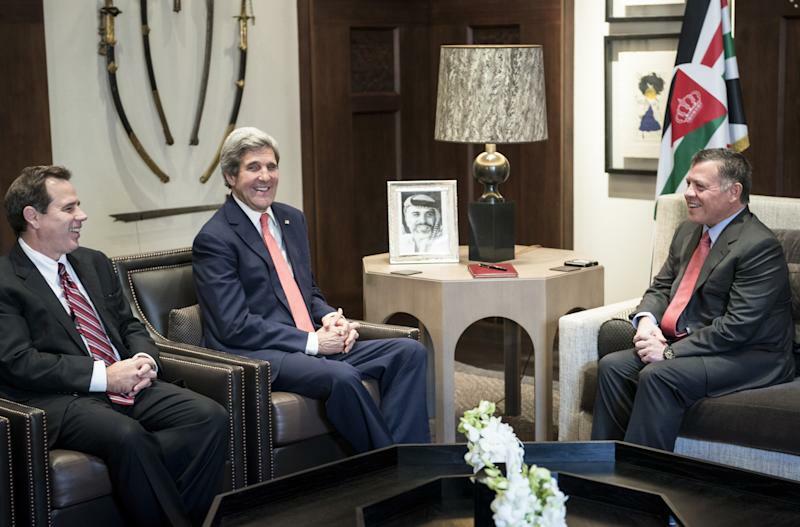 Reaching a deal on that framework is not expected on this trip, Kerry's 10th to the region for peace talks. On another issue roiling the Middle East, Kerry did not dismiss the idea that Iran could play a constructive role in finding a resolution to the civil war in Syria, even if Tehran is not a full participant in a conference on Syria this month in Switzerland. The U.S. has objected to Iran's participation because it hasn't publicly endorsed the principles from an earlier peace conference that called for a transitional government in Syria, and is backing militias, including the Iranian-allied Lebanese Hezbollah group that has aided the troops of Syrian President Bashar Assad. "If Iran doesn't support that, it's difficult to see how they are going to be a ministerial partner in the process," Kerry said. "Now could they contribute from the sidelines? Are there ways for them, conceivably, to weigh in? ... It may be that there are ways that that could happen," Kerry said.